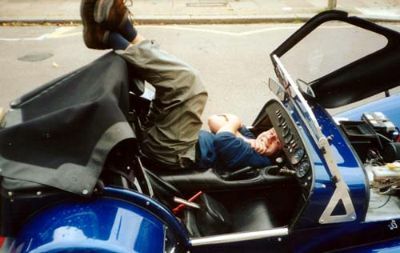 The only way to get under the dash and repair the windscreen wiper mechanism! This section will grow as our miles pile on and more bits need replacing or repairing! I can only detail our experiences - I don't claim that anything here is gospel, but it is our experience, with our car, in our circumstances. Hopefully you will find something usefull, and maybe some of the stuff here will save you time or future problems. Our car has actually proved to be very reliable, considering the use it gets as an only car, on road and track and long European tours. Since we had it we have had one understandable head gasket failure - caused by the failure of another component (thermostat) and a continuing saga of an occasional miss. This particular problem has now been fixed and is detailed in the electrical section. We have had an alternator break, and the odd starter motor problem (though not the usual 'k' hot start problem). 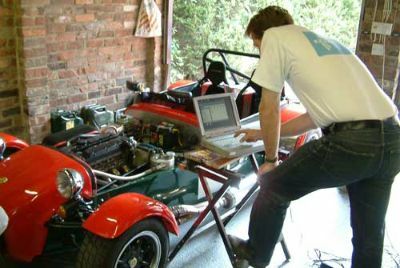 None of these problems have kept us off the road for longer than a few days, partly due to the help that is always available either through fellow owners, experts or the 'Tech' section on Blatchat, which is an unbelievably useful resource. Big thanks goes to Peter Carmichael, who has helped us with advice and assistance since we first got the car. Here he is plugged into Mark's Vx engined 7. And another massive thanks to Mark Collins. 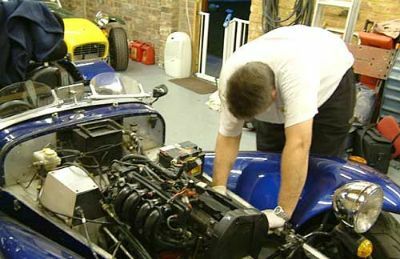 He has helped us with every aspect of working on our car, which can be regularly found in his fantastic garage! The help we receive from Mark, Peter and others is a massive help, and helps us run our car on a relatively small budget - the only way we can do it and run the car as our only vehicle. Except for that very early had gasket failure, when the car also got its last 'official' service at 24,000 miles, our car has never spent time in a 'real' garage.